Kuwait’s exciting new state-of-the-art race circuit will host the country’s return to the FIA Middle East Rally Championship (MERC) after a one-year absence this weekend. It marks the first time that the facility has ever been used to host an FIA event. Kuwait Motor Town Race Circuit was inaugurated under the patronage and attendance of His Highness the Emir Sheikh Sabah Al-Ahmad Al-Jaber Al-Sabah on March 28th this year. The Kuwait Imternational Rally is based there this week with the fourth round of the regional rally series taking place over 13 timed desert special stages from Thursday through to Saturday afternoon. The new facility is situated in the area of Arifjan, 52km south of Kuwait City, and was constructed in 14 months. The project was the vision of the Amiri Dirwan and was brought to reality by renowned German engineer and circuit designer Herman Tilke. The site holds seven different race tracks, including an FIA grade one main race circuit of 5.61km, and also features facilities for drag racing, karting, motocross, rally and dune racing. 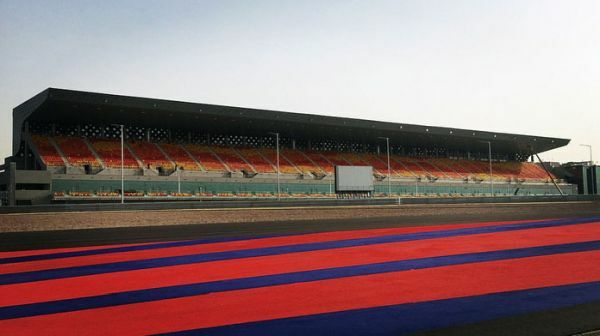 There is sufficient seating and space for around 8,000 spectators, VIP halls, media facilities, 32 pit facilities and parking for around 3,300 vehicles. The race track itself was laid by the Arizona National Company in association with Trimble, the machine control technologies company. The Kuwait International Rally started at the Sirbb karting track, near Kuwait City, in 2016 but has followed its neighbours in Qatar and Abu Dhabi to utilise excellent race circuit facilities to host off-road rally events. Both the Qatar International Rally and Qatar Cross-Country Rally use the Losail International circuit and the Abu Dhabi Desert Challenge traditionally starts and finishes at the Yas Marina circuit. Nasser Saleh Al-Attiyah is the leading competitor in the FIA Middle East Rally Championship and has been impressed with the new start location in Kuwait. “This is an excellent facility and I am sure it will have a very exciting future in world motor sport,” said the visiting MERC series leader, who starts as top seed this weekend. Jordanian motorcycle enduro rider Ata Al-Hmoud won his category at the recent Jordan Baja and is in Kuwait for the rally. “I have been very impressed. The circuit, the set-up, the pits, the facilities, they are all state-of-the-art,” said Ata. Competitors carried out their first day of route reconnaissance on Tuesday and will be permitted a second day to check the route on Wednesday before the competitive action gets underway with a timed super special at 16.00hrs on Thursday (November 1) after the ceremonial start at the Kuwait Motor Town Race Circuit. This year’s event is being organised by the Basil Salem Al-Sabah Motor Racing Club (BMRC) under the chairmanship of Sheikh Athbi Nayef Jaber Al-Ahmad Al-Sabah and in conjunction with the General Authority for Sport and the Kuwait International Automobile Club (KIAC).